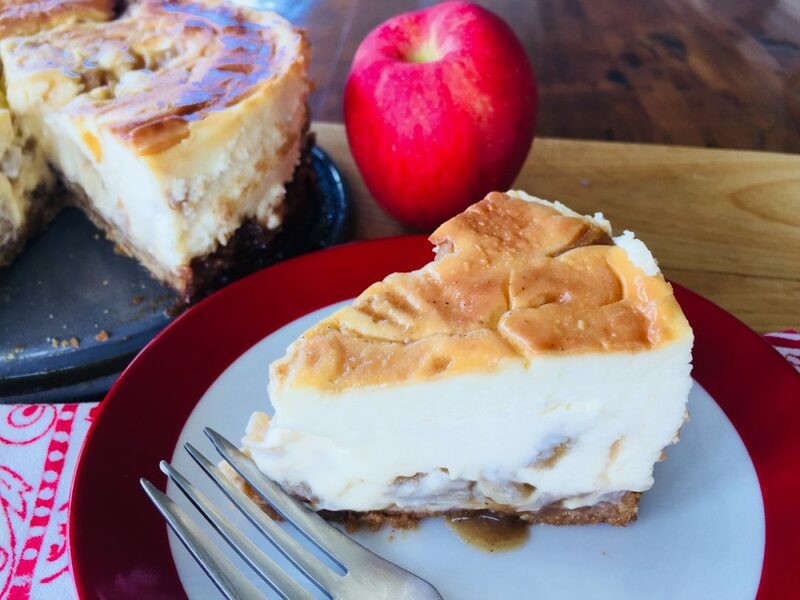 Caramel Apple Cheesecake - Recipe! - Live. Love. Laugh. Food. 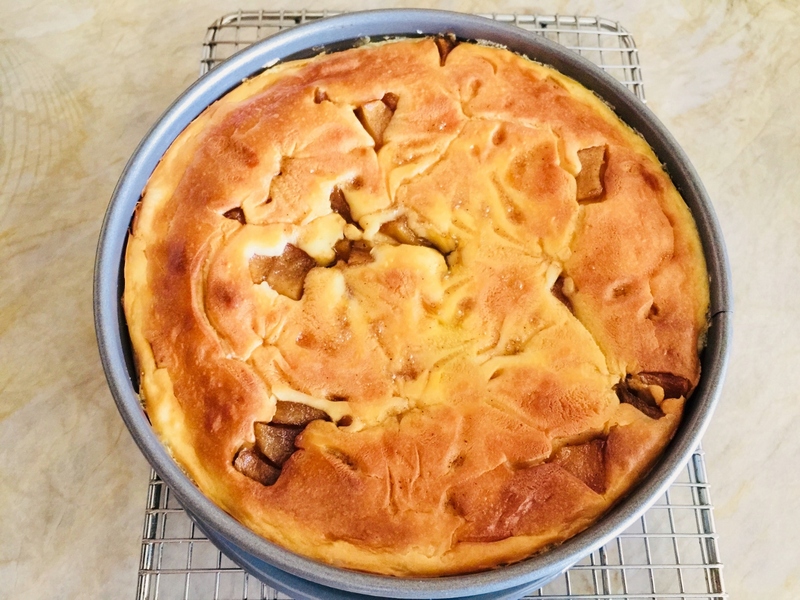 Caramel Apple Cheesecake – Recipe! Caramel apples remind me of fall, especially when apple season is in its fullest. I love to walk by a candy shop where I can see gooey dipped apples coated in all sorts of goodies like; marshmallows, nuts and candy coated treats. On occasion, if I’m with a family member, we will buy one of them and take it home to share. We usually cut it into eight pieces so we can savor the sticky sweetness for as long as we can. I happen to grow my own apples in the backyard. I think they are Galas, but since the tree was here before I was, I’m not exactly sure. During October, it’s always a race between me and the squirrels as to who can get to the ripest apples first. Most of the time they win, much to my chagrin. 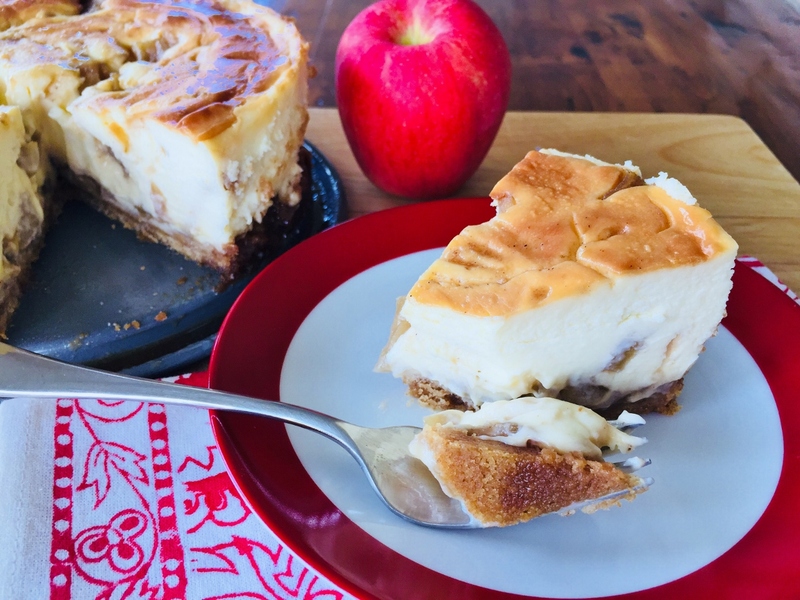 Cheesecake is another family favorite, so during this apple season I thought a combination of the two treats would be wonderful. This cheesecake has a traditional batter, but then I fold in a freshly made caramel apple concoction that has fall flavors all over it. The batter is layered into the pan in two stages and bakes up creamy with a hint of syrupy caramelized sugar and dotted apples throughout. Just thinking about it wants me to go grab a piece, but because it’s only breakfast time I think I will hold out for a few more hours. I love to serve this cheesecake at parties, or after dinner for a super- duper treat, and most likely I will make it again for Halloween. 1. Preheat oven to 325 degrees. Wrap outside of springform pan in foil. In a food processor, pulverize all crust ingredients together into fine crumbs. Pour into springform pan and press into bottom. Bake in oven for 10 minutes, remove and let cool. 2. Remove skin from apples and dice. 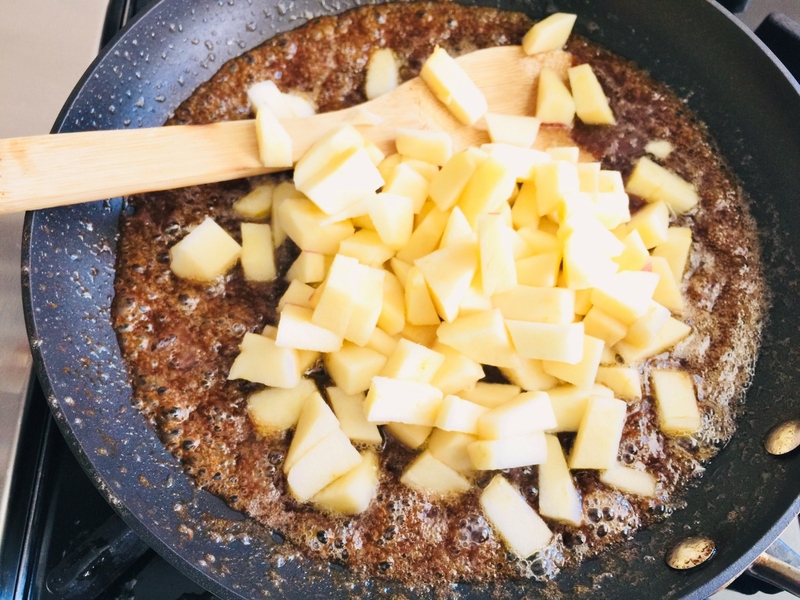 In a saute pan, add butter and sugar and place over medium heat. 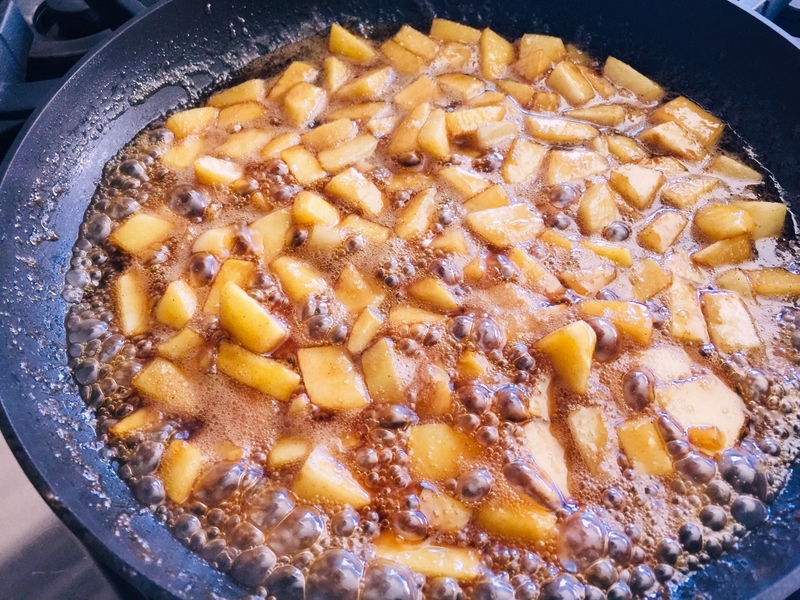 When melted, add apples and stir. Cook for 4 minutes, allowing liquid to reduce slightly. Turn off heat and add vanilla and cinnamon, stir to combine. 3. 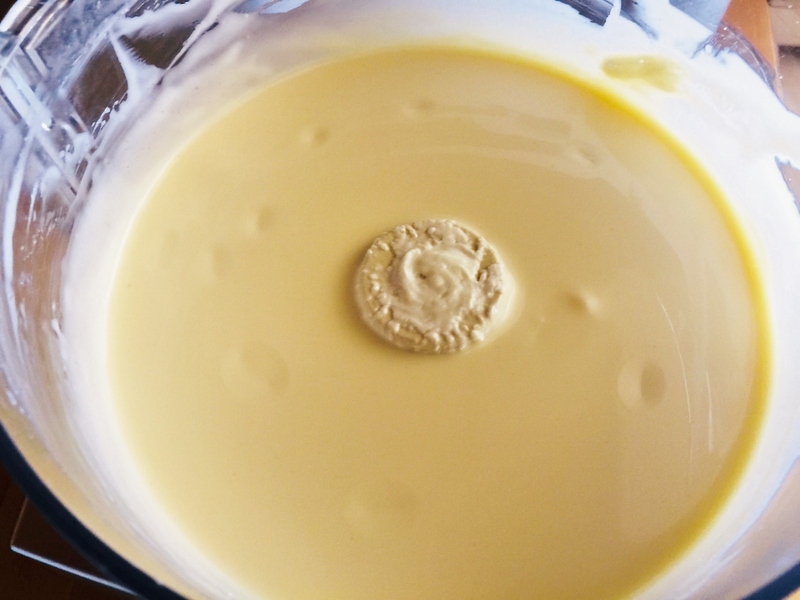 In food processor, add all cheesecake ingredients and mix until smooth and creamy, about 1 1/2 minutes. Pour half of mixture over crust. Spoon half of caramel apple syrup over batter. Repeat, ending with caramel apple syrup on top. 4. Place springform pan in a large casserole dish and fill with hot water halfway up sides. 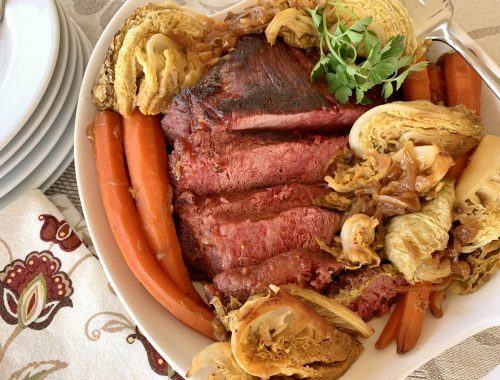 Carefully place casserole dish in oven and bake for 50-55 minutes, or until mostly firm, but center slightly jiggly. 5. 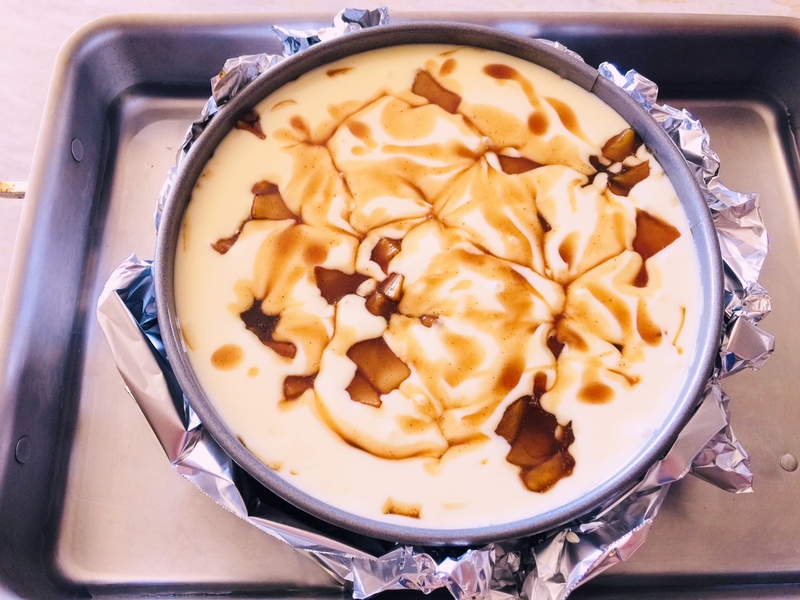 Remove dish from oven and let cheesecake rest in water bath for 5 minutes. Remove cheesecake from water bath and remove foil wrap. 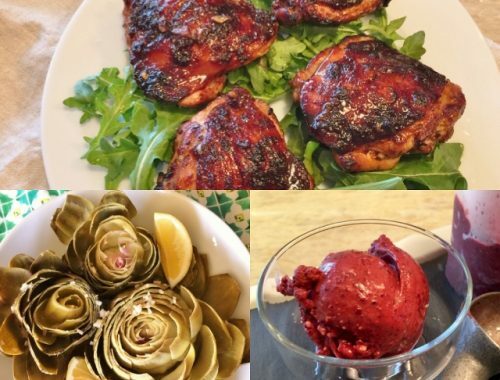 Let cool to room temperature, about 1 hour. Place in refrigerator for at least 3 hours before slicing. Enjoy! 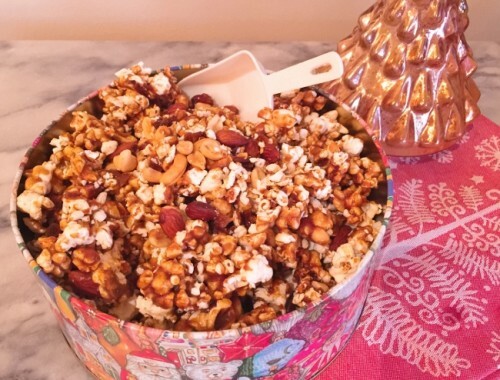 Nutty Holiday Caramel Corn – Recipe!